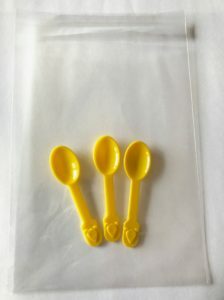 Sweet Sips Colostrum Spoons are small, soft-edged spoons suitable for collecting and feeding the term healthy infant in the early days. The size is just right for those first precious drops of colostrum. Providing moms and staff with this small tool helps to promote early hand expression and exclusivity in the first few days of life. PayPal is accepted for payment. Checks are also accepted, call 866-535-8780 for further information. Sweet Sips Colostrum Spoons can be ordered in bulk, or in individual patient packs of 3. Hospital purchase orders are accepted. Sweet Sips Colostrum Spoons are BPA free and made from food grade plastic. Sweet Sips Colostrum Spoons are manufactured in North America. For every order of 1000 spoons or more, a $10 donation is provided to Hope on Haven Hill, New Hampshire – a home for mothers in recovery and their infants. USLCA does not endorse the use or sale of this product. Post expires April 9, 2020.